For those hunkered down with beer and/or chips in one hand and an emergency flashlight ready in the other, we’ve compiled the best desktop and mobile apps for you to know what type of a beast you’re going to be facing — provided you still have power to read this and access them, of course. While there are obvious channels to follow the storm like #Sandy on Twitter and Instagram, here are a handful of apps that can keep you in the know during the hurricane. The Red Cross Hurricane App might be the most important tool for surviving a natural disaster should you find yourself in dangerous conditions. 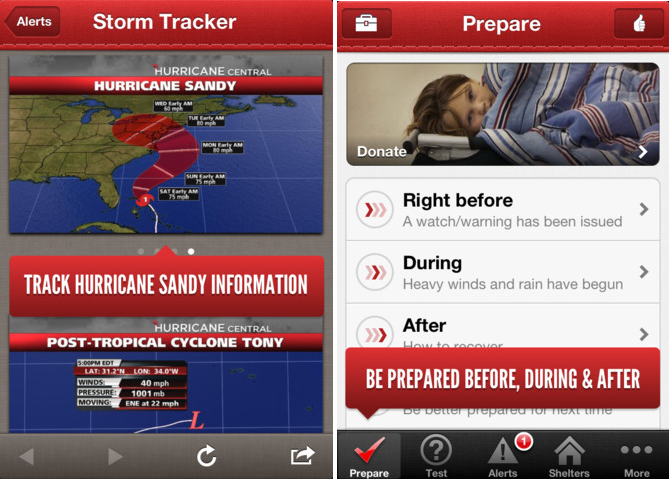 It’s a robust app that you can use to find the nearest Red Cross shelters, go down a checklist of precautionary measures in the event of a hurricane, or to even let your friends and family know that you’re safe with an “I am safe” one-button messaging feature that shares your status to your social networks. Even when you’re without an Internet connection, the app offers a flashlight, strobe light, an alarm, as well as pre-loaded offline content. The app is free and available on both iOS and Android devices. As we reported earlier, Google has released a desktop app that aggregates all Hurricane Sandy information from various sources to give users a comprehensive picture of what we’re dealing with. Emergency preparedness information, evacuation routes, hurricane location tracking and forecasts, storm surges, and traffic conditions are just some of the information that you can find on Google’s Crisis map. Reddit is an excellent source for first person accounts as well as important news links about the storm. You’ll find Redditors asking each other about the current storm conditions in certain locations, offering tips based on similar experiences, or sharing the latest news stories and photographs. 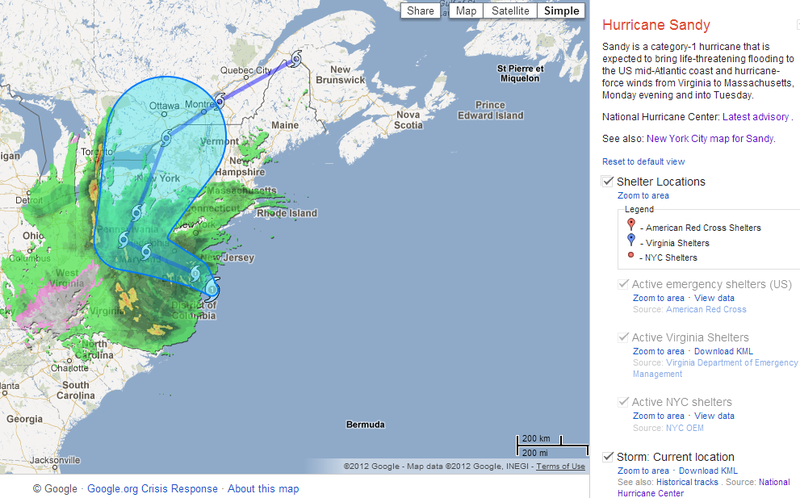 /r/sandy is a great place to dig in to either via your mobile device or desktop with an incredibly active community. 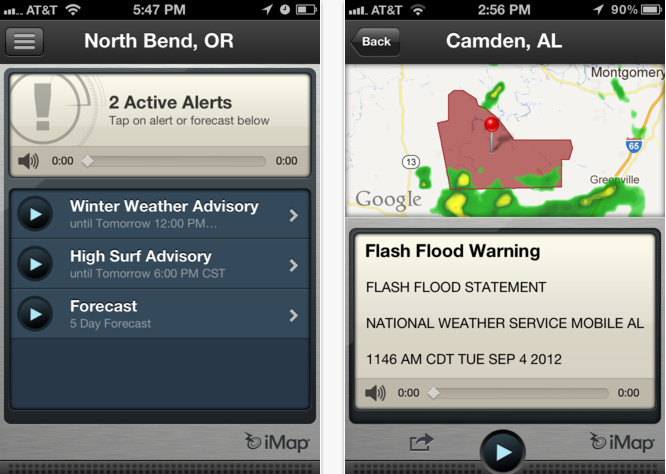 iMap Weather Radio is a location-based mobile app that notifies you of the latest weather-related threats through push notifications, graphically designed radar maps, and voice alerts. You can also listen to weather forecasts provided by local radio stations, powered by NOAA Weather Radio, or even watch the latest streaming video of local weather coverage. The caveat with this app for iPhone users is the $9.99 price tag. The Android app on the other hand is free, although lacks features like the NOAA radio, and users have complained about its bugginess. Weather.com – You’ll find Weather.com to be among the most recognized news sources covering the latest developments on Sandy. You may have also noticed the “LIVE NOW” alert at the top of YouTube’s page, which directs viewers to the online livestream of Weather.com’s continuing coverage of Hurricane Sandy. Livestream.com – Livestream is offering live coverage through its 24/7 New York City Sandycam that belts out statistical statuses of the affected areas and their current status including water levels and wind strength, while livestreaming New York City through traffic cams. Sandy Streams Map – Locations where livestreams are running have been plotted in Sandy Streams Map, with radar maps of wind speeds superimposed. New York Times – This “livestream” captures an image every thirty seconds from the roof of the New York Times building to showcase the city from a bird’s eye view as the storm approaches. Hurricane Sandy Facebook page – Not surprisingly, Hurricane Sandy has its own Facebook page, where fans are publishing the latest photographs of the storm’s impact as it happens. Instacane – Instacane is back after it was build to collect all Hurricane Irene images last year. 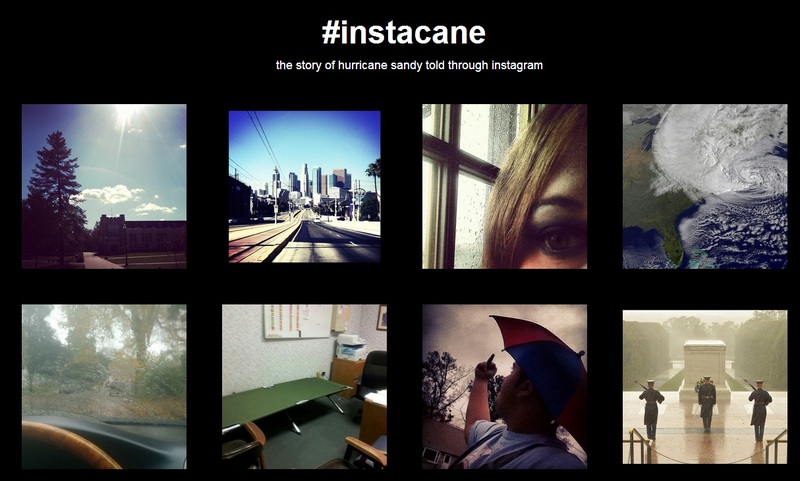 This time Instacane has been repourposed to display the latest Hurricane Sandy images shared to Instagram.